You work hard to take care of your teeth. You brush, floss, have regular checkups and teeth cleanings, but your teeth look dull, yellowed, and dingy. With all the time and effort you put into keeping your smile healthy, Dr. Patel thinks you deserve a smile that looks great too. That’s why we’re offering $299 Zoom! teeth whitening package. If you’ve used at home whiteners, whitening toothpastes or mouthwashes, you may have been disappointed with the results. At home whitening products are often ineffective in removing stains from the dentine layer (below the enamel). Hydrogen and carbamide peroxides are the only way to remove these stains, and while most at home whiteners have at least one of these ingredients, they are not as strong as Zoom! whitening and do not penetrate the enamel as easily. Zoom! whitening’s proprietary formula is made to remove deep set stains from your tooth enamel and the dentine layer below. This exclusive offer includes in office Zoom! 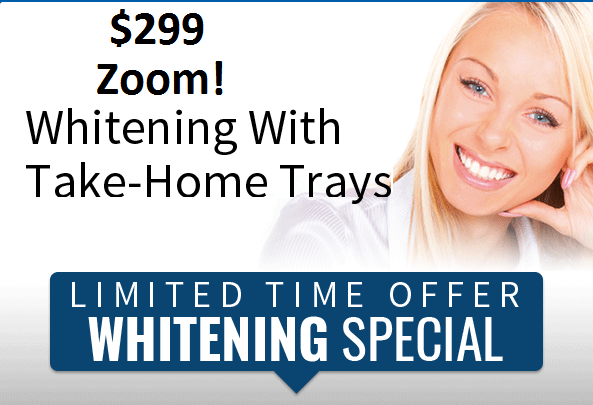 Whitening and custom whitening trays and professional whitening gel for at home maintenance. If you’ve been wanting to try Zoom! Whitening, there’s never been a better time. Call to schedule your appointment today, or check out our website to find out more about other services and special offers.